This detailed map is double-sided for maximum coverage and includes both sheets 58.04 and 58.08. The northernmost map, sheet 58.04, covers the South Shore area from Waterloo Road southward to Harrow Side Lane and Highfield Road, and eastward to Middle Lane. 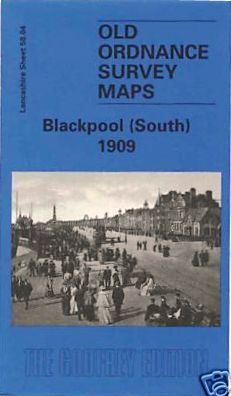 Features include the South Pier, Waterloo Road station (on Kirkham & Blackpool line), Lytham Road station, tramways, Star Inn, Arnold House. Several streets south of Balmoral Road are only partly built up. The backing map, sheet 58.08, continues coverage south, and is largely undeveloped. Features here include tramway and tram depot, Layton Hawes Farm, Stony Hill, Starr Hills.